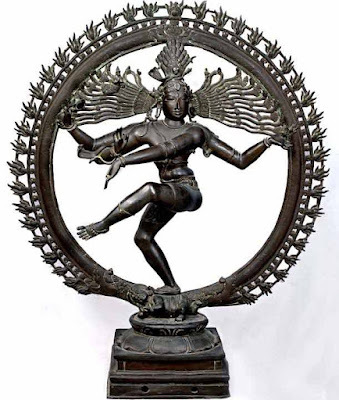 Nataraja Statue at Home – Can It Be Kept in Home? Can Nataraja statue be kept at home is a doubt among several Hindus. This is because there is a belief that the Nataraja form of Shiva is associated with Tandav – dance of destruction. As this form of Shiva is associated with the negative energy it should not be kept at home. This is mere superstition. We should be proud of the Nataraja murti and not spread superstition about it. Firstly, Shiva or Nataraja is not associated with destruction in the negative sense. Shiva is responsible for regeneration. One cannot but marvel at the deep insight and sweep of imagination of our ancients to visualized cosmic energy in the form of Nataraja. The dance of the Nataraja symbolizes truth and beauty; realization and dissolution; force and rhythm; movement and change; time flowing and time still. The Nataraja is a representation of the divine as creator and artist. Nataraja is Guru or the eternal teacher. The little drum in one of the right hand is meant to express the idea that God is the cause of the world and it can undergo transformation anytime. The little deer is the mind that roams around wildly. The tiger skin that Shiva wears represents egoism. Ganga is wisdom or chita shakti and moon is the blissfulness. One foot crushes illusion in the form of a demon. The foot that is raised is the Turiya state, one which is above the three states of waking, dream and dreamless sleep. Nataraja statue is pregnant with symbolism. It is the ultimate Guru – the spiritual guide from the world of illusion to our natural home – the home of self-realization. So do not listen to silly superstitions. The Nataraja statue is a marvel. It contains the teachings of Hinduism. Each aspect of Nataraja form is a guide to those who wish to escape from this mundane existence. Have a Nataraja Murti at home and study and learn more about it. It is also a classic example of the expertise of ancient Hindus in the world of metal. We should be encouraging the artisans involved in making Nataraja and other traditional handicrafts. The cosmic dance of Lord Shiva (Nataraja) represents five activities – Creation, Protection, Destruction, Embodiment, and Release. In essence, it represents the continuous cycle of creation and apocalypse. This cosmic dance takes place in every particle and this is the source of all energy.